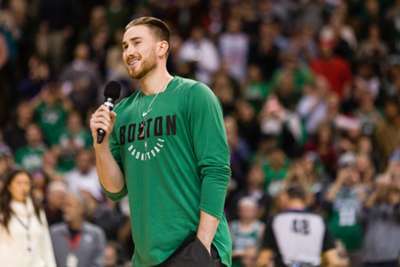 Boston Celtics forward Gordon Hayward, who suffered a season-ending ankle injury last October, provided a positive update on his recovery on Thursday. Hayward, 28, was selected by the Utah Jazz with the ninth overall pick of the 2010 draft but signed a four-year deal worth $128million with the Celtics last July. He suffered the ugly ankle injury toward the end of the first quarter in the first game of the regular season. "I'm feeling really good right now. I've had two weeks now of playing full-court basketball, five-on-five, pretty much no restrictions, still trying to keep a progression of how much time and how much load I'm putting on that ankle," Hayward said. "But for the most part, I'm feeling very, very well, just excited to be out there. It's so much fun being able to play again, and play with my team-mates, and using these past two weeks and the next month or so will be good to kind of get back into the game, feel the rhythm, the timing, different things like that, but it feels pretty good." He added: "I would say I'm basically 100 per cent. "There's certain things that I think are going to take time even if I was 100 per cent healthy, I'm not 100 per cent as far as basketball-wise, just because I haven't played in a year. I'm trying to figure those things out. "The last step for me as far as from a physical standpoint is a little explosion, that little last juice bounce that you get. So that's going to take me the longest time, but like I said, for the most part I feel very good." The Celtics, playing in a perceived weaker Eastern Conference because of LeBron James' departure from Cleveland, are the preseason favourites to reach the NBA Finals.